Even though its not quite Halloween, Emma has decided to give you all a "Beary Special Treat"! This doesn't cause weight gain but will cause CUTENESS OVERLOAD! Included in this hop, you will see a "Beary Special" stamp set that was designed by Emma for this special hop! Also, joining us for this hop are 5 VERY TALENTED "Guest Designers"! You can buy this super cute stamp set HERE! Today's center stair step card uses this super cute stamp set and the new Cricut Lite Teddy Bear Parade cartridge, available at cricut.com and Walmart (store and online). It measures 5-1/2" x 5-1/2", which is a bit larger than regular but I just loved the stair step display aspect of this card. It's very easy to make this kind of card - check out Split Coast Stamper's instructions HERE. All you have to do is leave your comments on each designer's blogs! Leave a comment below letting me know if you loved teddy bears or dolls more. I was a teddy bear girl myself. In fact, my mom had a business making teddy bears out of fur coats - they were gorgeous! The more blogs you comment on, the BETTER your chances are at winning! Random.org will pick all the winners on Tuesday! Okie dokie, here is the blog hop line up! I LOVE this bear and card! WOW! This is beautiful! Love this card style! Such a sweet card!! Love it! I am looking forward to seeing everyones projects! What a cute card! I just love the baby bear. Beautiful! and Adorable. Love your card. What a great style card! Will def check it out. Great job, I love it! Awesome! Love the card and the bears!! Oh my goodness, I love this card!! cutest things made with it. that played music and wiggled! I still smile when I think of that little doll. Thanks for the chance to learn and win! I'm a teddy bear kinda gal, and I've passed it on to my kids, who are obsessed with Build a Bears. Thanks for a chance to win....love love love teddy bears. Love the idea of combining the teddy bear cartridge with Emma's stamps. So cute! I am going to spend the rest of today, just hopping from one blog to the next. I would love to win, any of the prizes..Good luck to me, and thank u to all the ladies in this blog for being such generous hearts. Adorable!!! What a sweet colorful baby card. And I love the step style! Sooooo very cute!! I'm a big bears fan...so this is just perfect. Your card looks super sweet! Love it! The bear, the papers you used and that cute little sentiments goes perfect all together. TFS. I was a doll girl! Such a Beary Sweet card it is! Simply adorable! TFS! Stinkin cute Joy! What and adorable stamp set perfect for that cartridge! Awww! This card is so Beary Sweet! I love it! Great job and I like the step card idea...I always like different types of cards. As a child, I played with dolls more, but later I became "obsessed" with teddy bears--not in the "real" sense--I drew them, wanted posters with them, had to have t-shirts with them! LOL! 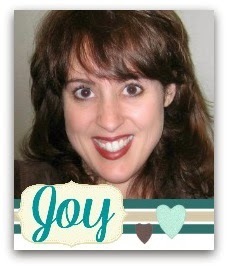 Joy, love your card! It's so cute and the paper is so colorful! Super cute card!! Love the cut with the sentiment!! I prefer teddy bears!! Wow, your card is adorable!! Love the pretty colors. Joy ~ Okay this is way too CUTE!! I LOVE the cut and that bear!!! I really thought I didn't need this cartridge but everytime I see it I want it more! Eeek! Well LOVE the papers but that step card! I have to give this a try ~ Thank You for the link! TOTALLY ADORABLE!!! How cute! I was trying to create a baby shower card last night and got stuck. Maybe your adorable card will help get my creative juices flowing. Sweet stair step card. Perfect for baby. Adorable! So adorable, love the card. I have been searching for baby Ideas!! Thank you for sharing this one!! Yay!! Love the inspiration. HI Love your card so cute. I love the card style alot! Very cute card overall. I was a doll lover as a child. I don't remember having a teddy bear until I became an adult. I have quite a few teddy bears now and no dolls. Thanks for sharing your creativity with us. This is such a cute and adorable card! Love this stair stack card. I am getting ready to start all of the holiday paper crafts and I'm envisioning something with this AND something from My Creative Time! Love your projects - always! Adorable card!! LOVE the baby bear!! I love the way you did your card! It's Beary cute!! awhhh....so cute love the stair step card! I always loved Bears! Although I did go through a Troll phase too. Love your site beary much. Cute bear. I love your card. so super cute love that baby bear and great colors. tfs! This is just DARLING!!! I truly can't remember which I liked more, but I have one daughter that prefers dolls, and one that prefers teddy bears! Very cute card Joy! Love this design! Your card is adorable! I am loving the baby bear-I've been seeing some cute bears from this cart. 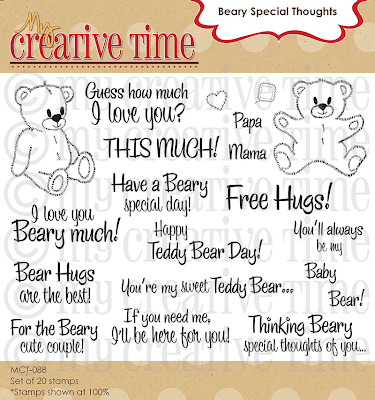 I also think Emma's bear stamp set sentiment is perfect! oh wow! I love this card! all the colors and the bear is too cute! love the design of this card too! awesome job!! Adorable card. Love teddy bears the most. Aww! Your baby bear is so cute! I love the stair step card! Great card Joy! Love your colors! Really neat Card Joy. Thanks for sharing. I've never made a stair step card, but I'm going to give it a shot! Great inspiration! Love the card. It is so cute. Beautiful card, Joy. So happy that you're a guest designer for this release. Thanks for the link to the tutorial, I can't wait to make a center step card. Bears for sure I still love them and have several in my home. Your bear card is so cute. What a beautiful card. Would love to win. Thank you for the chance. Your bear card is so cute! I love your card. I would be so honored to win one of these prizes. Thanks for the chance. LOVE this card! Can not wait to get my hands on this super cute cart -- especially with this super cute stamp set!! Cute Card! I too love this style card! This card is so adorable and sweet! What an incredibly cute card. That baby bear with the pacifier is too cute. Thanks for sharing. Isn't she sweet with her little binky. 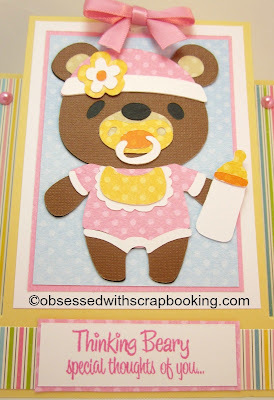 Such an adorable card, I just love teddy bears and Teddy Bear Parade is at the top of my wish list. The bear sentiments are just perfect to go with this cartridge! Love tha fold and tried to make it and failed but Need to try again. love your card so cute, I loved my baby dolls. Cute style of card. Teddy bear is so adorable. Great bear card and I love the shape. 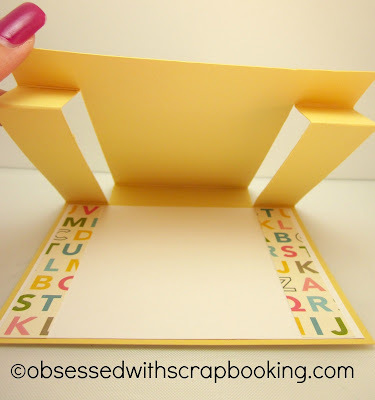 love all your scrapbooking ideas, keep doing them thank you. I love your card. You did a wonderful job!!!!! Super card - thanks for sharing. I love your cute card!!! :) Thank you so much for sharing the link for the unique fold! And I still LOVE teddy bears (more than dolls)! Do you still have some of the ones your mother made?! I would live to see puctures! OMG! I finally gets my bears!!! I have a whole curiocase full of bears from ceramic to Greatmothers and mothers stuffed bears when they were kids. My favorite is my Teddy Bear picnic music box! Darling card and thanks for sharing a new style, I will have to try this after the Hop! Such an ADORABLE card - and I love this type of folded card! What an adorable card! I love the center step and that bear is just too cute! Awesome sentiment and color combo!! HI Joy! I like the teddy bear! He is very cute and can be used for many different themes. Very cute card! I was deffinitly a Teddy bear girl! I still have bears Ive collected and I'm a grandma! This set is perfect for me. Thanks tor the chance! Great stamp set and project! Thank you for the cute idea. Bears are the best, much better than dolls. To this day I still have some of my children's Bears! Joy, this is just so cute! Definitely the most adorable baby bear ever!!! Adorable card! I've loved teddy bears every since I was an infant. I still have my very first teddy bear! Love this card....it's so darn cute. Thanks for the great idea. Love it! Love this card...bears are the bomb! How Cute!!!! Love the bears! Thanks Joy, going to blog hop in the car. Coworkers having lots of babies, so I will be making lots of cards. I am definitly a teddy bear girl!! Super cute card!! Such an adorable cad. I love the colors you used and the bear is adorable. What a cute card love the folds. Very cute center step card. I like the stripes and polka dot paper you used. I think I only had one well loved teddy bear growing up but I definitely like teddy bears better than dolls. Ahhh, teddies are so cute. thanks for the step card idea. Love this card. I would love to win the giveaway so I can make items for my grandchildren who love bears. This is so adorable...definitely "cuteness overload"! So fun to see you on Emma's hop. I was a doll girl but only because my family/Santa didn't give me a bear! Love the card, cartridge and stamps. This is so super cute! I prefered teddy bears! Love your card very cute for a baby card. I love this little teddy. He is so cute. Such a sweet card! Really like the bright colors you used. Love love your card! And I love love bears!!! Beautiful card is very sweet, thanks for sharing. LOVE this style of card! This is really adorable!!! GREAT card,Joy! What a positively adorable card! A great design for a sweet little bear! Such a SUPER stamp set! What's NOT to love about this card! You always do such inspiring work Joy! I love teddy bears! And this card is SO adorable. I would LOVE to win this cart! These little bears are so appropriate for three grandchildren under the age of two! The stamps NEED to be purchased with them to make the set complete! Perfect! I love your bear card soooo cute!!! Love the stair step card. The stamps are cute too. you are never too old for bears. they cheer you up. I have a collection of my own. Tooo cute. Love the Teddy Bear cartridge - this bear card is just darling. Great job. Really like the sweet bear. the colors of paper are great and the stair step design is so cool. I was more of a doll girl. In all actuality, I made furniture for my dolls etc. I never really roll played. LOL. Adorable card! And it's a special fold too! I was a teddy bear kid myself...never quite got into dolls. Such a cute set. Lots of inspiration here! I loved dolls. I still have the doll house my grandpa built me and my dolls live in my craft room. Can't wait to get my hands on this new cart! Such adorable images!! I definitely loves teddy bears more ~ I have a very well-loved teddy from when I was little. I did have a couple of dolls that were like Kewpie dolls that had soft furry bodies and vinyl doll faces that I loved, too, though. I just love the stair-steps - and the bear. So cute! This little baby bear is scrumptious!! The bears are my favorite!!! I love that bear and the colors you used. I need to look at SCS to find a tutorial on folding that style of card. Such a sweet card. I love this cartridge and this stamp set will go perfectly with my new cartridge. Can't wait to use it. You did a great job on this card! The colors are great. What an adorable card ~ from the cart to the design to the colors! Too cute! I'm a Teddy Bear girl ~ love to hug! Cute Card! Teddy Bears are the best!! Hope I win! !!! 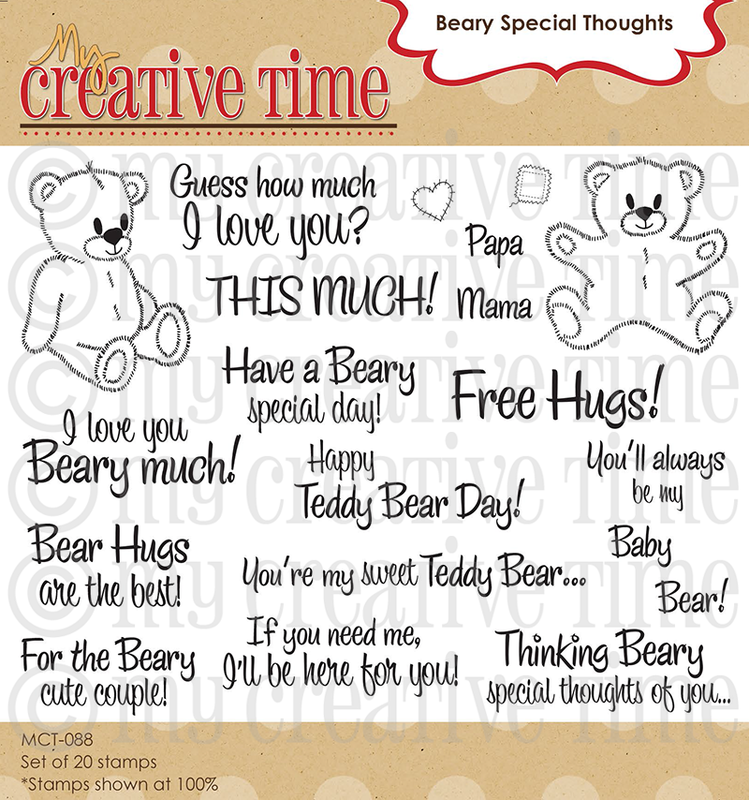 These are the best Bear sentiment stamps ever! I've always been obsessed with bears, awe. So cute. What an adorable step card! Love it! I love this card, especially the flower on the hat. Kudos to you for such a cute card. Love the center stair step card. I have several of these already to decorate. I love the baby one. I am a teddy bear fanatic and I absolutely LOVE this card. I MUST get this cartridge and Emma's stamp set to go along with it!!! Thanks for sharing such a cute project that just makes you smile!!!! Well done! I've always loved teddy bears more than dolls. Thanks for the chance to win! I was a doll kind of girl. But if we would have had build a bear around when I was growing up I might have been a bear girl. I liked dressing up my dolls & there weren't clothes for bears around back them. Now that I'm older I have three books a bears & several outfits for them! Your Teddy Bear Card Is Too Cute! Thank You For Sharing. Awww!! Your card is so cute! Love the teddy bear with the paci! I love dolls and teddy bears, but I remember being excited to get the seasonal bears during Christmas time. I think it was kmart that had different bears that came out every year and I HAD to have the one with the year on it. My daughter always loved teddy bears too! wow!! I LOVE your card! and the stamp set is so cute! I loved dolls, Barbie dolls, paper dolls, you name it. Thanks for the chance to win. I am going to need this set. Too cute, thanks for sharing. I liked both dolls and teddy bears growing up. My dolls needed pets after all. lol. Love the bears - waay too cute!